Haritashya, U., M.P. Bishop, J.F. Schroder, A.B.G. Bush, Henry N. N. Bulley (2009). "Space-based assessment of glacier fluctuations in the Wakhan Pamir, Afghanistan." Climate Change 94: 5-18. 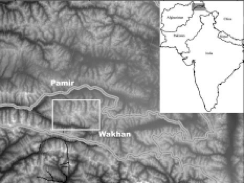 Paper is focused on the Wakhan Pamir which there is no data for in WGMS so as part of GLIMS this study looked at the glaciers from 1976-2003 using Landsat MSS and Aster imagery and found the glaciers to be retreating at a fast rate. Overall the paper is a focused study on a region which can only be looked at from space. -The study uses a numerical GCM to come up with past, present, and future climate conditions with the future scenario assuming atm carbon dioxide levels are double the pre-industrial value. -The study smoothes the topography of the Hindu Kush and the Pamir to meet the resolution of the GCM but doesn’t this introduce a lot of error as climate is very much driven by topography, especially in an area of high relief where there may be many micro-climates. Seems like it is just a very broad assessment for the region which I bet would be off due to actually topography. It does say that insight may be gained into regional climate change due to orbital and greenhouse-gas forcing. -Study found that 6,000 years ago according to the GCM simulation climate conditions were similar to today and 9,000 years ago were colder with more precip and that a doubled CO2 content would result in a 4-5C increase in temp with increased precipitation as rain. -They came up with an approach for snow-line detection using NDSI, an aster-derived DEM and Boolean logic with snow maps but were kind of vague on how they did it. -They found that larger glaciers with high average retreat rates exhibit relatively thin debris cover over ice, which can enhance ablation. Smaller glaciers at high elevations did not have much debris cover. -Downwasting is a major part of the glacier mass loss in the region, rather than strict terminus recession. Can only measure this temporally by using different DEM’s or perhaps ASTER derived DEMS for Rainier and Hood but those are of low resolution and may not work compared to LiDAR. -Found a relationship between glacier size and retreat rate. Larger were faster, but no significant difference in retreat rate of glaciers with different orientations. -Paper also talks briefly about supraglacial lake formation which doesn’t really apply to my work. Overall this paper would be a great reference in a paper as to the usefulness of satellite remote sensing, especially free Landsat imagery for an area that can’t be reached on foot because of political instability.